HARLOW, England, April 10, 2019 /PRNewswire/ -- Haag-Streit UK (HS-UK), the leading manufacturer and distributor of gold-standard optometry and ophthalmic equipment, enjoyed a successful Optrafair 2019 at Birmingham NEC on Saturday 30th March-Monday 1st April 2019. HS-UK delivered a series of very successful CET-accredited sessions, which were run on the HS-UK stand in the dedicated Haag-Streit Academy education 'hub'. The 'Slit Lamp Masterclass' workshop was facilitated by Kirit Patel, Radlett Opticians. It covered effective examination of the patient and illumination & magnification techniques. 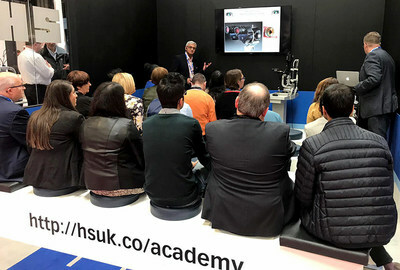 This was a very popular and busy workshop which highlighted the superior quality of the Haag-Streit slit lamps and slit lamp imaging systems. 'Binocular Vision', hosted by Sam Laidlaw, HS-UK Product Manager, included information on understanding common binocular vision conditions and a discussion about practical clinical techniques. This was the first time HS-UK had run an educational session on binocular vision. It was very well-received by delegates and served as a great refresher for those who had not used these techniques in clinic recently. Grant Duncan, HS-UK Clinical Training Manager, hosted 'Wide-field, Confocal Multimodal Fundus Imaging'. It covered the definition and advantages of confocal imaging, wide-field imaging and the key clinical applications. Attendees received a FREE copy of CenterVue's 'Clinical Atlas'. Alongside all the education sessions, HS-UK also showcased a large selection of its product portfolio, including; the gold-standard Haag-Streit BQ 900 LED Slit Lamp with IM 900 imaging module and Octopus 600 perimeter. Other products exhibited included the; innovative AngioVue OCT-A and iScan OCT devices from Optovue; CenterVue DRS retinal camera and Eidon AF wide-field confocal scanner. Grant Duncan, HS-UK Clinical Training Manager, said, "We were delighted to, once again, participate in this year's Optrafair Educational Programme. We delivered 6 CET-accredited sessions over the 3-day event and had some very positive feedback from delegates. The 'Slit Lamp Masterclass' was a particular highlight with the session full-to-capacity. It gave attendees the opportunity to learn from our product experts and gain some valuable hands-on experience with our gold-standard slit lamps and imaging systems."